Subscribe to The Keynote and receive your free copy of The Keynote Guide to Organizing a Successful Conference.This practical guide is packed with useful advice for first time conference organizers and will help you plan every aspect of your conference, from establishing a timeline to booking a venue. The Keynote Guide is FREE - get it here. Is your conference website projecting the right message? Find out how you can get the best from your website. With dozens to chose from, how do you choose the right registration system for you? Or, check out onlineregistrationreview.com for more information free resources for event planners. Get a grip on your conference budget with our step-by-step guide to planning your conference finances and free registration fee calculator. 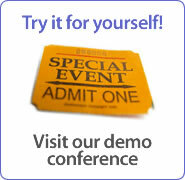 Find out how to develop a vision for a successful conference using a pre-conference evuation. Tell your friends about The Keynote.